Plate IV. 12. Scymnodon ringens, Bocage and Capello. Drawings from Bocage and Capello. 13. Centroscymnus coelolepis, Bocage and Capello. Collected off off Martha’s Vineyard in 372 fathoms. 2/3 natural size. 14, 15. 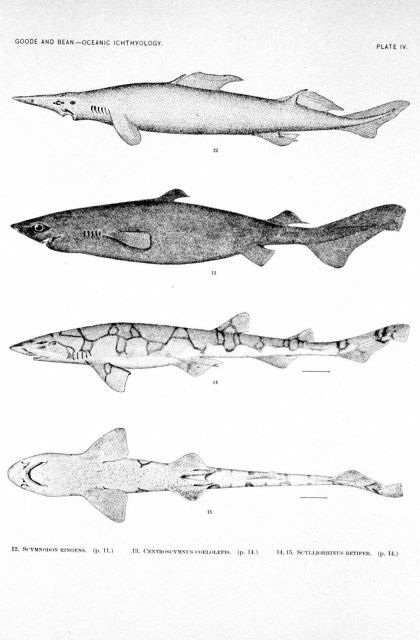 Scylliorhinus retifer, (Garman), Jordan. Drawings by H. L. Todd, specimen collected at N. Lat. 37 26, W. Long. 74 19, at 56 fathoms.